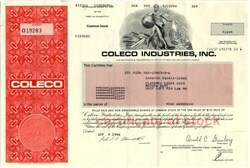 Beautifully engraved certificate from the Coleco Industries, Inc. issued in 1988. 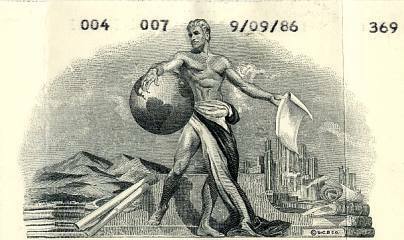 This historic document was printed by United States Bank Note and has an ornate border around it with a vignette of man holding a globe and a newspaper. This item has printed signatures by the Company's President and Secretary and is over 28 years old. Some Folds. In 1981, Coleco Industries obtains exclusive use of Midway's trademark on self-contained and portable electronic versions of Midway's coin-operated arcade games. In 1982, Coleco Industries announces the ColecoVision video game system. Sega and Coleco ship the Donkey Kong video game cartridge. ColecoVision was as close to a home arcade as you could get in 1982. The company knew this, and their marketing reflected it. Coleco went straight for the big arcade licenses, starting with one of the biggest: Donkey Kong. The company paid Nintendo a pretty penny for the rights to this platform-climbing, anti-ape classic, but the deal was well worth it. With Donkey Kong as its pack-in title, the ColecoVision sold well over a million units by the end of the 1982 holiday season. ColecoVision stuck primarily with established arcade hits in the early going�Mouse Trap, Venture, Lady Bug, Donkey Kong Jr., Carnival, Zaxxon, Pepper II, Looping and others�but the system also introduced a feature that expanded its game library by the hundreds. Released in 1982, the Expansion Module #1 plugged into the expansion slot on the front of the machine, allowing ColecoVision owners to play each and every Atari VCS/2600 game�and by this time, there were plenty. Atari sued (eventually winning a share of the profits), but sales were brisk and Atari-owning kids were left with no defense to the �my system�s better than your system� taunting. In 1985, Coleco came out with the Cabbage Patch doll. Parents stood in long lines outside store doors trying to find one of the promised dolls for their child's Christmas present. Although the short supply was initially cursed by many parents, Coleco went on to record sales of $600 million in 1985. Ignoring lessons learned in the past, Coleco decided this craze would last and began a massive expansion. In 1986, sales of Cabbage Patch dolls fell to $250 million and the company lost $111 million. In 1987, the company lost another $105 million. In 1988, Coleco filed for bankruptcy.